Today we do not expect the release of significant fundamental events that may affect the price movement of the most liquid instruments of the Forex market. It means that we would focus on the psychological sideways trend of the market, which may be indentified with the help of technical analysis. The first important data will come out on Wednesday: the Bank of England Governor Mark Carney’s speech. Up until that point the most probable price movement of the GBP/USD is in sideways market. However, it can be breached as investors expect the US dollar to strengthen further. Here we consider the GBP/USD on the H4 chart. 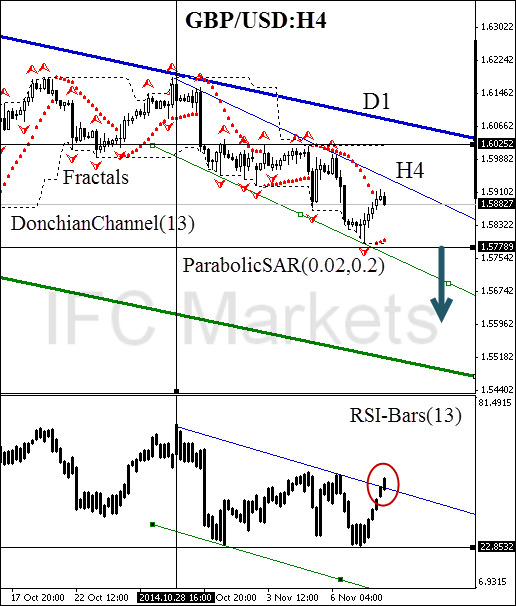 The price is moving within the D1 and H4 trend: the bearish trends coincide. Currently, a retracement can be observed: it will be finished after the fractal support breakout at 1.57789. It will happen when Parabolic historical values cross the price, so that the trend indicator would reverse in the direction of the red zone. The significance of the support level is also confirmed by the lower boundary of Donchian Channel. The most alarming signal was received from RSI-Bars: the upward breakout of the trend line. Conservative traders are recommended to wait for the oscillator signal return into the trend channel area. Stop Loss is better to be placed above 1.60252. This mark is confirmed by the upper boundary of Donchian Channel and Bill Williams fractal. After position opening, Stop Loss is to be moved after the Parabolic values, near the next fractal high. Updating is enough to be done every day after a new Bill Williams fractal formation (5 candlesticks). Thus, we are changing the probable profit/loss ratio to the breakeven point.